Gas might cost a bit more, and they couldn't help with any problems, but they had a cash machine and were open 24 hours a day. They also sold snacks, and that counted for a lot. I wanted to try a few buildings with the Ainsty Castings Shop Fronts. I use a lot of their accessories, and wanted to see if they could make my building projects easier. The Try-n-Save without the pumps. For this project I used a shop front, 2 rear corners. 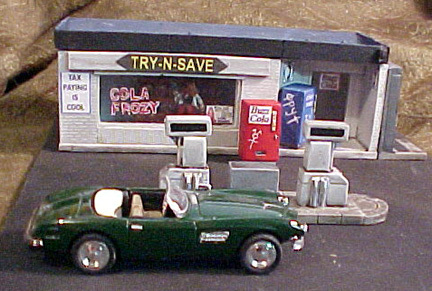 and a wall section, plus a cash machine, 2 vending machines, and a set of gas pumps. The roof is a piece of Cintra, extended out to form a shade for the cash machine on the end of the building. Assembly is straightforward, and the fit is good. There are few bubbles, and most pieces have none. The detail is good, with finely-done and convincing brickwork. The accessories are as always, top-notch. There are grooves and slots to position the plastic for the windows & doors. All you need do is cut them to fit and slide them into place. Upon reflection, I think I'm going to rip this apart and redo it. I'll use the canopy as a new roof for the building and have the pumps on a smaller, canopy-less island. 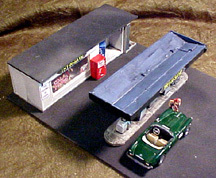 I can build a new shade for the cash machine, and use the canopy supports elsewhere.